Jordy's Beauty Spot: HOW TO: PENCIL SKIRTS! Recently i have been wearing quite a lot of pencil skirts. They are a versatile fashion staple and each girl should have at least one. There is something about them that is sassy, classy and feminine that i love. Wearing a pencil skirt has the power to make you look more mature and serious whilst still looking fashionable. 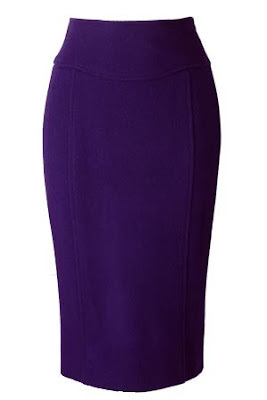 In this post i will assist you in how to wear pencil skirts and the many variations. LENGTH: The length of a pencil skirt, suspecting that it stars from the skinniest part of your waist, should reach just above you knees or at knee length. This makes the skirt suitable for work or formal situations but short enough to show some leg and compliment your figure. TOP: With pencil skirts you can tuck in your top or leave it out. Most find that tucking it in is more complimenting and excentuates the thin part of your waist. tops with ruffle detailing are super classy with pencil skirts as they dangle over the waitline. Sequin or beading detail is also very cute and adds a little something. COLOUR: These days there are many colours to choose from. if it is a work situation or formal occassion then i wouldnt bust out in the bright purples just yet. Stick to the plain black, navy or grey. I would say white but white pencil skirts tend not to be very complimenting so you will not find a huge range of such clothing. ACCESSORIES: Usually if you have a detailed or ruffled top then you won't need a necklace, even if it is a plain tank top i would leave the necklace. Focus on charm bracelets, bangles and cute earrings. Colours that match your top and if you are wearing a belt will look amazing if applied to your acessories. BELTS: Some skirt come with built in belts already but if not then there are many to choose from. There are skinny belts which are very simple and if you match the belt with your colour shirt then it will break up the black and colour coordinate. There are also stretch belts which come in a one-size-fits-all type thing and you can do the same with the colour matching your top thing. The last kind of belt is a black one with an attachment to it , meaning a brooch or something, which really brightens up your outfit and adds a little glam. TEXTURE: There are many choices such as cotton, lycra, leather, knit and much more. But i would keep the lycra and leather pencil skirts for a fancy dress party or exotic event. 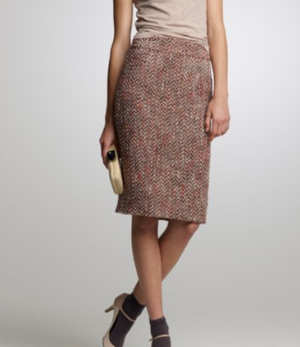 The basic pencil skirt is made of cotton as it is soft, comfortable and often comes in stretchy. The knitted kinds are more couture than anything so expect to pay big bucks for high brands if you like the knitted look. FOOTWEAR: A pair of heels are killer with this outfit. Black pumps are a no-brainer but if you are feeling adventurous then go with a really bright heel which will complete the outfit. Flats are fine also, try cute flats to the same description as the heels mentioned above. In the workplace you want to look serious but stylish, fashionable but feminine and professional but powerful. Keep the skirts black, the tops white or neutral and you will be all of the above. Spice things up with your choice in belts and accessories. Don't forget that by adding a pair of killer heels it will top the outfit. However, if you ever do feel like branching out and taking a risk then try a different coloured top to coordinate your shoes, belt and accessories to. Remember that work clothes can be fun and exciting to. Make sure you are excited in what you are wearing and if you aren't then it will show on your face. So pick comfortable work clothes that your happy with and are excited to wear. I currently have a video on YouTube showing an OOTD where i am on my way to work and i am wearing a pencil skirt. So if you would like to see an outfit that i have pulled together, using a pencil skirt then please click here. Id so love to have a job where wearing a pencil skirt would be required/wouldnt look weird.. Ive just starting school, and I only wear pencil skirts with heels, and even though it's a casual dress school, I dont think Id wear heels to school! Although Im thinking bout it cos I got some cute new studded heels YUM! Ps. Ive been watching your YouTube :) Youre making us Aussies proud! Youve got loads of Subscribers already! Looks like your working hard. Your so full of information. this made me realize that i really need a pencil skirt. I am going shopping sometime next week and am fo sho going to look out for a nice pencil skirt. thanks hon. I hate coloured skirts because they are tacky and gross but i like black ones even then they dont suit my body shape. Wait...are you a teacher? I thought you were studying to be a nurse? Oh yeri saw those studded heels on your blog...THEY ARE SO GORGEOUS!! I would wear then even if it was casual dress. Thanks, its good to know and yer everyone seems to be very supportive. I am, thanks so much. Pencil skirts are so versatile and i would reccomend investing in one for sure. Have fun shopping!! Yer sometimes colour is a little tacky espcially in a formal situation. I am sure you will find a pencil skirt that suits you if you keep looking around. dont worry i will and yes i will fo sho check out pencil skirts. $32?? where are you located? Because for some weird reason i always thought they were about $19 ? then again, i have no idea, since i use euros and not $. Thank you, yes very true! Oh okay thanks for the tip. Its a bit like that with some colours of eyeshadow! 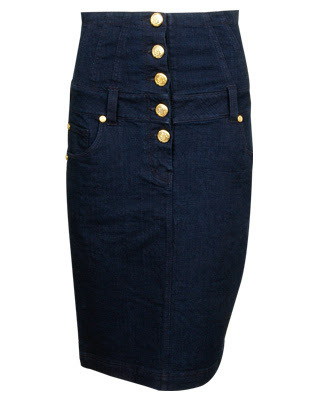 Yes $32, i live in Aystralia so its preettyy pricey. I think if you double euros then its the Australian $. So like if something was 19 euros then it would be $38 dollars. Thanks again for the post!